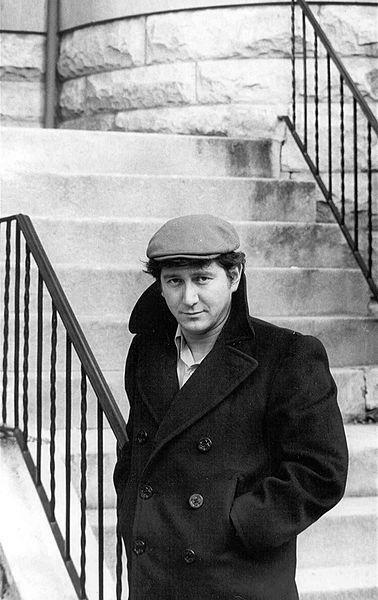 In 1962 an Ohio State student, a singer and guitarist named Phil Ochs, moved to New York City and was soon at the center of the booming folk music scene in Greenwich Village which included Bob Dylan, Joan Baez and Peter Paul and Mary. Today Phil Ochs’ music is less well known than some of his colleagues’—but it still delivers a powerful message. 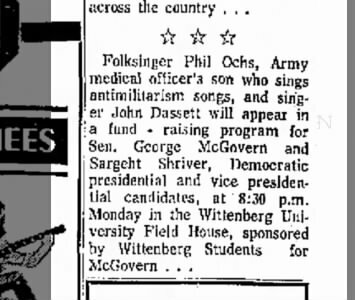 Phil Ochs performed at Wittenberg University in Springfield in late October 1972. He was originally drawn to country music—but at Ohio State he was exposed to the socially conscious music of Pete Seeger and Woody Guthrie. At Wittenberg he sang his own song about labor activist Joe Hill; this performance is a part of the WYSO archives. “I thought the American public was going much more conscious around 64-65 when the anti war and civil rights movements were coming together and it was very strong then before drugs came into the picture. They were getting strong. There was incredible widespread consciousness in 68 when Kennedy and McCarthy were running. It was fantastic. That was probably the high point. And now I don’t know. I mean now everybody’s disillusioned and taking quaaludes,” said Ochs. The next week Nixon triumphed at the polls with the fourth largest victory margin in U.S. presidential election history. Ochs continued to travel the world singing where he felt his songs could help make a difference. By 1976 with the Vietnam war over and Nixon washed away in the tide of Watergate, Ochs —fueled by alcohol and crippling bi-polar disorder—was reeling. In April of that year he would commit suicide at the age of 35. The songs of Phil Ochs live on, as young musicians continue to discover his music and bring it to new audiences.